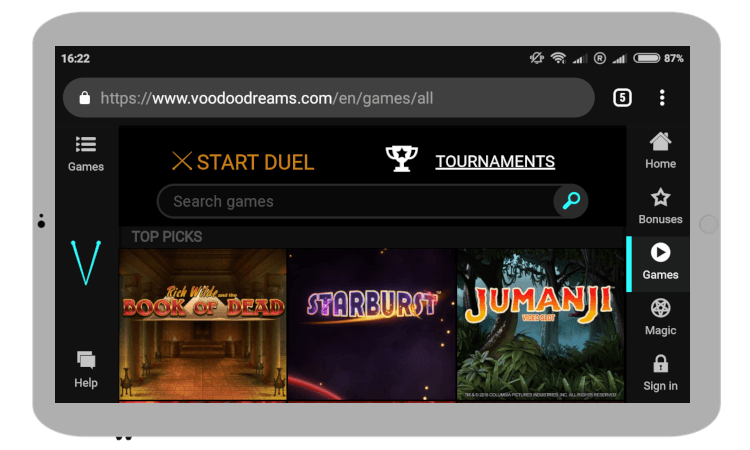 Read our complete Voodoo Dreams Casino review for the latest bonus information, free spins, games, payout speeds – and other usual information. However, Voodoo Dreams also have two unique features up their sleeve – Duels + XP & SP Points – which offer something a little different to the rest. Read on to see whether they’re for you. *UPDATE* – Voodoo Dreams is not currently accepting UK players at the moment. They’re working to accept British gamers as soon as possible, but until then you can see our other top casino sites in UK for alternatives. Voodoo Dreams is a pretty decent casino site that was established in 2016 by SuprNation – the same company behind NYspins and Duelz. This link is kind of easy to spot when you look at all the bonus features that these three share, alongside a few other similarities with other online casinos. Before you can claim your bonus, you have to open your account. This is super easy. Just fill in your personal info – such as name, address, phone number and a couple other things. Then, verify your account and you’re ready to claim your bonus. If you’re a player from Sweden, Voodoo Dreams Casino has BankID for the fastest possible sign up – no form needed! To get you started, all eligible players at Voodoo Dreams Casino will receive 20 free spins on registration. You can use these no deposit free spins for Starburst, Joker Pro or Wild Wild West. NOTE: unfortunately players from Germany, Austria and Switzerland are not eligible for this no deposit bonus. Canadian gamblers are exempt from any free spins within the welcome bonus. Sorry! Again, this is exactly the same offer you will find within the NYspins review. Still, we cannot say that we mind this offer being replicated – as it’s pretty big and lasts for a while. We couldn’t really ask for more, and only a few casinos can compete with such a huge casino bonus package. N/A – No bonus codes are needed when playing at Voodoo Dreams Casino. The 200 free spins on offer here are a lot of fun – with Joker Pro, Wild Wild West, and NetEnt’s Starburst slot being popular games. Sure, the Professor’s favourite bonus sees free spins given for any game – but the 20 you get just for signing up more than makes up for that. Even bonus terms and conditions are shared between the different casino sites. You can only use a maximum stake of 5 euro here while playing through the wagering requirements of 30x. These apply to both the bonus + deposit of your welcome package. Any free spins winnings, and subsequent deposit bonuses, come with x40 wagering. Any winnings from the Voodoo Dreams Casino no deposit bonus are capped at €100 (or equivalent). It’s a shame to see wagering count for both your deposit AND bonus, making the package not as enticing as before. A minimum deposit of €20 (or equivalent) applies to all deposits (not just bonuses). As your Voodoo Dreams Casino bonus won’t last forever (despite the dreaded batches system! ), they’ve conjured up some pretty interesting casino gamification features. There’s nowhere better to begin than the Duels mode – which allows you to challenge fellow players to a slot battle. There’s no need to trawl through a list of competitors as Voodoo Dreams Casino will pick one out for you automatically. Once you’ve selected your strategy – Defensive, Balanced, Aggressive, Rage – every single spin will then count towards the fight. Each player has so-called Health Points (HP) which need to be eliminated for a duel to be won. It reminded us of the classic Pokemon battle on Gameboy, just with, perhaps, more at stake! All winners of Voodoo Dreams Casino duels will be handed additional SP points. It’s pretty obvious that this feature was a success – as SuprNation decided to spawn their very own Duelz Casino brand based on it. However, Voodoo Dreams will always be the spiritual home of Duels in our opinion. Instead of the one-pronged approach, Voodoo Dreams Casino have created a loyalty program whereby two types of points are collected. Right after you start playing, you will immediately start acquiring XP (Experience) and SP (Spirit) points for every winning bet/round/spin/hand you make. But how do XP and SP points differ? Experience Points (XP): These define your Voodoo level, which in turn determines what kind of Spells you can purchase and how strong they are. XP points are collected automatically, and you’ll be promoted once a certain number have been acquired. When this happens, you’ll unlock new, stronger Spells – and best of all, you can never be demoted! Spirit Points (SP): But Spells aren’t just given to everyone, as they have to be exchanged for SP points. You can collect SP points by playing games and using different offers, and a bonus prize is also given for every Spell you redeem. Naturally, the stronger the spell the more costly it is – with the power rated by 4 categories: Blood Magic, Dark Magic, Light Magic and Spirit Magic. Spirit Magic: This depends on your Voodoo level – but expect either wager-free free spins or cold, hard cash! Of course, before you start earning XP & SP Points and taking part in Duels – you need to know what deposit options are available at Voodoo Dreams Casino. Don’t worry – it’s the usual suspects: Visa/MasterCard, Trustly, Entercash, Zimpler, Skrill, Neteller, Euteller, Citadel, Giropay, EPS, iDebit and Sofort. NOTE: Keep an eye on any fees you may be charged when making a deposit. Sadly, a 2.5% charge currently applies to Visa & MasterCard deposits. Skrill/Neteller: Within an average of 6 minutes! Trustly/Entercash/Euteller: Within an average of 6 minutes! NOTE: All of the above are subject to the standard processing time, which is up to a maximum of 5 days. Of course, our Voodoo Dreams Casino review has plenty of information on the games and slots you can play too. Currently, over 600 games are offered – and this is constantly rising as new releases appear. In and amongst, you’ll get to play slots, keno, bingo, progressives, table games and live casino. The games are provided by the best providers of course – like Betsoft Gaming, Microgaming, NetEnt, NextGen Gaming, Play’n GO, Thunderkick and Yggdrasil. See Voodoo Dreams Casino’s game providers above. Expect entertainment in a very versatile manner! The Voodoo Dreams mobile casino ticks all the boxes, which is imperative in this day and age. Feel free to use your mobile browser to play here, as no outside apps are required to log on. You’ll get to play with your Android as well as iOS seamlessly – while it’s also been confirmed that Duels is playable on mobile devices. Voodoo Dreams is operated by SuprNation. In fact, it was the company’s first ever casino site to be launched, so naturally there was caution given to it at first. Since then, they’ve allayed any safety fears by proving to be secure and credible. This reputation allowed them to launch two sister sites in the subsequent years. To operate, Voodoo Dreams Casino have a gaming license from Malta as well as from the UK Gambling Commission. This means there’s no room for foul play here. That’s not to say that you’ll never run into any issues. Problems do occur whilst gaming, and there’s always the chance you’ll need a bit more information. In these cases, you can contact Voodoo Dreams Casino’s customer support team via live chat or email. While they’re not available 24/7, the opening hours of 10:00am – 02:00am cover the majority of the day. Voodoo Dreams Casino are bound by the country restrictions set out by SuprNation. So, unfortunately, residents of the following countries cannot play here: Afghanistan, Algeria, Angola, Bahrain, Belgium, Bulgaria, China, Cuba, Denmark, Eritrea, Estonia, Ethiopia, France, Guam, Hong Kong, Indonesia, Iran, Iraq, Ireland, Italy, Kuwait, Libya, Malaysia, Marocco, Marshall Islands, Martinique, Mauritania, Mauritius, Norfolk Island, North Korea, North Mariana Islands, Oman, Pakistan, Portugal, Puerto Rico, Qatar, Rwanda, Saudi Arabia, Singapore, Somalia, South Sudan, Spain, Sudan, Syria, Tunisia, Turkey, UAE, USA, Virgin Islands and Yemen. They you have it – this Voodoo Dreams Casino review has its verdict! With hundreds of slots and games – plus the entertaining Duels mode – there is plenty to get exicted about if you give Voodoo Dreams a spin. Of course, they’re not perfect – with a few deposit fees, high wagering (in some cases) and other niggles being apparent. But thanks to their ability to think differently to other casino sites, it’s easy for the Professor to recommend them. Try your luck – and write your own Voodoo Dreams Casino review below!